"3D printing is just like regular printing except you’re stacking layers of materials on themselves. Imagine an inkjet printer and you lay down ink and everything that doesn’t have ink vanishes. You lay another layer of ink down and everything without ink vanishes. You keep going up and up and up until you have a full object. That describes 80 percent of the 3D printing technologies out there right now. What’s cool about that is that is doesn’t require any tooling. You don’t need molds—the way something looks is programmed digitally. There’s not really a lot of upfront investment aside from the initial programming, which is very easy to do. The materials that are most commonly used are thermoplastics, photosensitive polymers, things that can be ground into powders, things that can be extruded. There really isn't a limit to the materials and the palette is continuing to expand. I’m pretty pleased with what I’ve been seeing as far as material development goes, especially given the amount of time it’s been going on. I mean, 3D printing has been around since the 1980s, but it really hasn’t been that long since we’ve seen some really serious work being done in the materials area. It’s incredible. I think everyone working in that space is doing amazing work. I think the future is bright. The palette is going to be expansive." 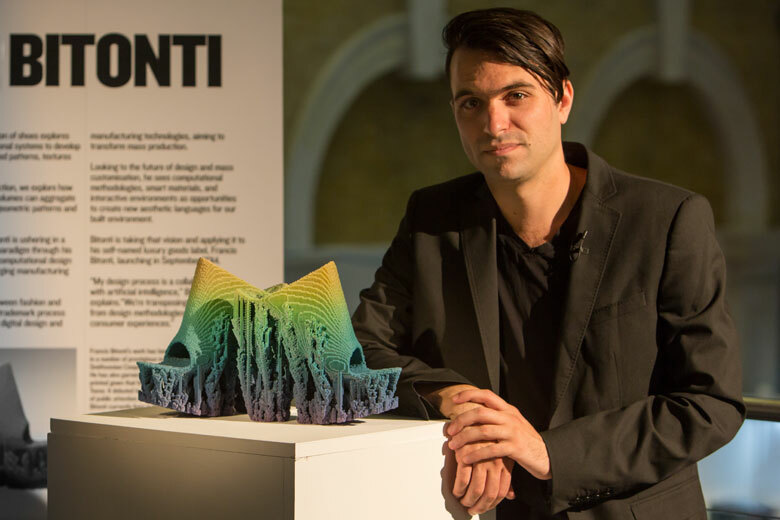 "I think one of the real goals of the studio is to make additive manufacturing mass manufacturing. 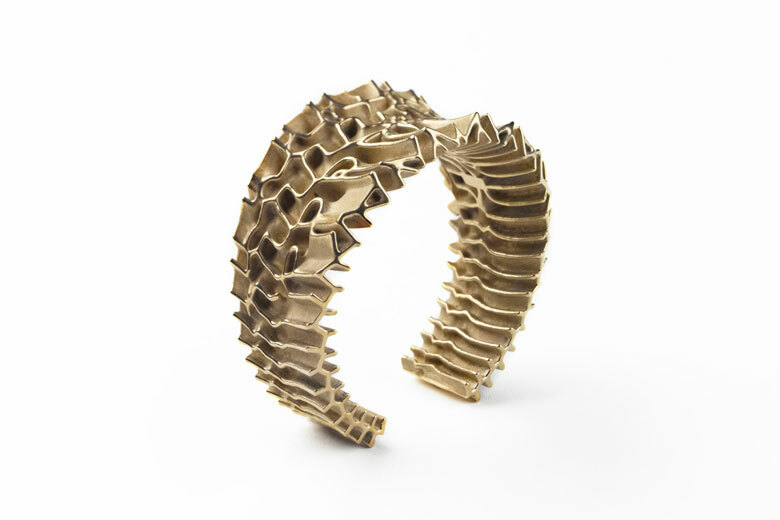 There are a lot of benefits to additive manufacturing and 3D printing right now. Because of the way the industry is structured at the moment, there are a lot of things holding back that reality. That largely has to do with the way manufacturing and printers are thinking about their business models and potential revenue streams. The industry started as a prototyping technology—there are still a lot of patents on this technology. There aren’t enough enabling technologies for people to be doing the kind of work that would lead to the kind of innovation that, in my opinion, would lead to mass production of the technology. It’s very much a lot of closed doors. That’s really our biggest road block. These forms look like they’re full of holes—they’re super intricate—because I had to find ways to make porous volumes look beautiful. It’s not that these things don’t work or they have to be used only for prototyping technologies or that the materials are substandard. The materials are fine. I think the big difference is that we can’t interface with these tools the way we’ve been able to interface with other tools. The industry isn’t setting itself up to service enterprise solutions." Fashion: How Does It Play Into Your Work? "A lot of the aesthetic emerged because we were looking to find another economy of form. I compare this to Eames. That was the language of modernist design that tried to respond to industrial processes. I think a lot of this work is trying to respond to post-industrial processes. These forms look like they’re full of holes—they’re super intricate—because I had to find ways to make porous volumes look beautiful. That was the cheaper method. I started focusing on systems and algorithms that lead to these porous shapes so I could find some sort of order or aesthetic language. I juggled the parameters that this manufacturing infrastructure was giving me. It’s actually a complete immersion of industrial manufacturing and the infrastructure we have now. Everything we have thought of as being efficient and affordable is the complete opposite here in most cases. Of course, that’s not a blanket statement. The other thing that’s really different—and we get asked this a lot—is being asked, 'What’s your perfect material?' Honestly, the materials aren’t that bad. What’s really different is the tool—they’re hollow interiors; we’re extruding a filament. The process of construction is different because we’re adding, not taking away. This is why I don’t really like to say the word 'industrial design' because industrial designers tend to use subtractive processes. 3D printing is very much about volume. Another one of the big roadblocks we hit is with software. The software is not set up for us to think volumetrically. It’s not really set up for us to think about composites. It’s not set up for us to think about the cross-section of the material because the cross-section of the material has always been a given. The surface of the materials is not a given in the traditional manufacturing paradigm. Here, I have to think about the entire surface and the volume." "The tactile, hands-on element of the design process is really just the litmus test for me. Can I tell the difference between one thing and another. As far as the role of hand in the construction, I’m trying to reduce as much of that as possible. I don’t want to engage craftsmen, to be totally honest. I think it’s just going to make it more complicated and more expensive to make. The more we have to rely on skilled craftsmen, the harder it’s going to be to coordinate quality and locations over multiple factories. It really all needs to be data- and information-driven, otherwise there’s no way to measure it. That doesn’t mean that the notion of craft goes away. There’s a lot of craft in the way we set up digital files, how we write procedures for tool pathing, and in the way we set temperature for the extruder head. There’s still material crafting and intelligence." "I really don’t appreciate the way the fashion industry has approached sustainability. There’s a tendency to want to revert back to craft processes. There’s a tendency to want to move away from technology and away from industrialization. It’s like, 'Oh look, we had it right back then.' We may have had it right back then, but we also had a lot less people in the world. Demands were different and so were expectations of garments. We were being incentivized to provide clothing and shelter for people. It doesn't make any sense to go backwards—you’ll just make sweatshops. That’s what the fashion industry has done. They’ve made a lot of sweatshops because we’ve relied on methods of production that are really not that scalable. Our expectations of a good garment require someone to spend a lot of time on it and the only way to grow that is to use a lot of cheap labor. They’ve gotten themselves into a tough position. What ends up happening is a lot of these sustainable garments cost a ton of money. You’re alienating yourself from the current flows of capital and then you’re actually making luxury goods. Obsolete technology is very often the crux of the luxury industry. Where did the luxury industry come from? It really came from industrialization. We lost a lot of craftsmen. We lost the ability to produce those kinds of things. It might look like a hippie tarp wrapped around your head, but it’s still a luxury good. You’re relying on means of production that are making it expensive and accessible. I don’t think it’s culturally relevant, I don’t think it’s appropriate. I think it’s really wrong and I’m very frustrated with that. If you think about foundation in an industrial design school, they give you a block of foam and you cut out of that block of foam. That’s completely counterintuitive to what’s trending in manufacturing technologies at the moment. We do have the potential to build a new manufacturing infrastructure. We do have the ability to build infrastructure for manufacturing that’s information-driven. If we look at trends in technology and culture, this is an inevitable progression. I don’t think we have a choice here. We can embrace it and say, 'Let’s do this right this time because we really screwed up industrial manufacturing.' There’s a chance to take ownership instead of being regressive. Let’s make policies that will prevent irresponsible distributed factories. There’s still a big problem with 3D printing, although it could potentially be zero waste. There’s local production. The other thing is that raw material production is still going to be centralized. It still is centralized in today’s industry. All of those spools of plastic filament—even though the consumer products might be made locally—those raw materials are going to be incentivized. I think there’s a lot to figure out in 3D printing to bring us to a really great future. It’s engaging these technologies and taking us out of a dependency on industrial processes." "I think design education is falling very short right now for a number of reasons. If you think about foundation in an industrial design school, they give you a block of foam and you cut out of that block of foam. That’s completely counterintuitive to what’s trending in manufacturing technologies at the moment. Not that the skills are useless, but students will graduate with a worldview that’s useless and I think that’s even worse. 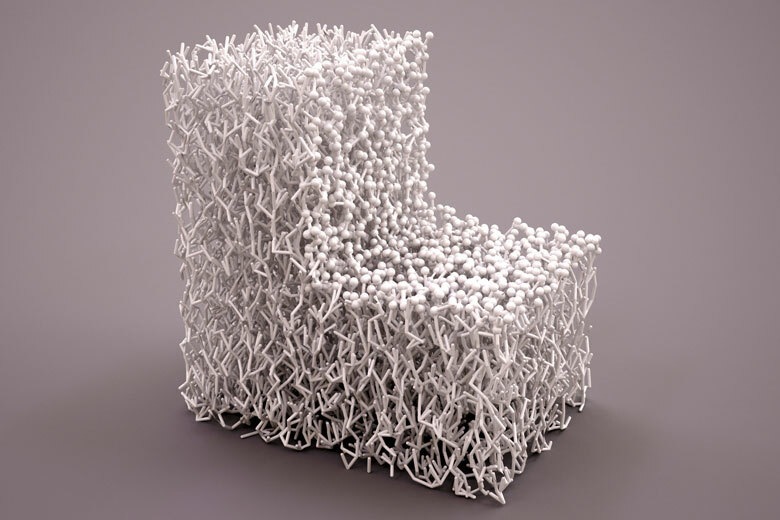 I think a lot of people who started doing interesting things on the design side in 3D printing are trained architects. If you think of the first year of architecture school—in most schools— it’s very abstract. It’s really about assembling things; it’s about components. It’s about thinking from a small scale and assembling to a large scale. They train to think additively. I’ve spent a lot of my earlier career teaching, and you notice people who have that kind of experience. Their mind is a lot more 'in the right place' to think about digital technologies later. Fashion schools, they have a similar problem. Again, it’s down to the idea of the understanding of the material world as you’re acquiring industrial materials. This was a fault of architecture education—aside from the modernists—for a long time because they didn’t industrially manufacture materials. Bricks are industrially manufactured products as are lumber and flooring—just as textiles are. That’s what the designer has been responding to in modernism. Once we lost the craftsmen, that’s what we had to deal with. There were raw materials, which became a garment or building or whatever. Then the designer would shape those industrial products into consumer products. The gap is a little different now. We’re going back to that model where industrial material is not as well-formed as it used to be. It isn’t really anything. It’s a spool of filament, it’s a bin of powder. You need to think of form differently to effectively design for that type of technology. Embracing the material world that way doesn’t do anything for anybody. Everything is possible right now. You’ve got to look at the parameters: What’s making this hard to do? Not impossible—hard to do. Design schools are in a lot of trouble because it’s really hard to change curriculum. The faculty aren’t trained to think like this. It’s going to take a while. That’s why we started running educational programs independent of universities. We tried to become a part of theirs, but it was really hard, especially in fashion schools. Most schools we talk to don’t even have technology courses. It’s sad, especially in today’s world. I don’t see how you could ever create something meaningful and part of our culture right now if you don’t at least understand how computers process information. It’s just not going to be possible. It’s an issue." What's Next for Francis Bitonti Studio? "Everything is possible. There’s nothing I hate more than someone saying, 'Well, this is like a 15-year project.' Everything is possible right now. You’ve got to look at the parameters: What’s making this hard to do? Not impossible—hard to do. If you can identify what those factors are, you can do it. You can make anything work. It’s just figuring out what your obstacles are and creating incentives to push things in the other direction. We’ve never lived in a time where things are impossible—especially now. We can do so much. So, I don’t know. We’re open to anything."